In February 1937 a Reichsluftfahrtministerium specification for a short-range reconnaissance aircraft was issued to Arado, Hamburger Flugzeugbau and FockeWulf. 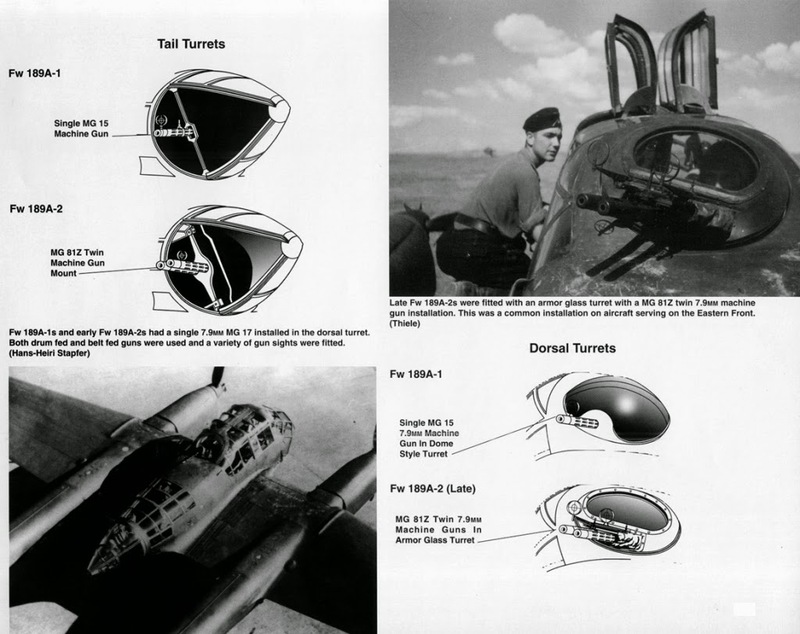 Kurt Tank responded with the Focke-Wulf with Fw 189 Uhu (eagle owl), an all metal stressed-skin low wing monoplane that had an extensively glazed fuselage pod, and twin booms carrying the tail surfaces. The mainwheels retracted to the rear, into the booms. The crew nacelle provided accommodation for pilot, navigator/ radio operator and engineer/gunner, and power for the prototype was supplied by two 430-hp (321-kW) Argus As 410 engines. Construction of this aircraft began in April 1937 and designer Tank performed the first flight in July 1938. The Fw 189 V2 second prototype, flown in August, was armed with one 7.92mm (0.31-in) MG 15 machine-gun in each of nose, dorsal and rear positions, two fixed MG 17 weapons in the wing roots, and four underwing racks each carrying a 110-lb (50-kg) bomb. A third, unarmed, prototype was flown in September, this Fw 189 V3's engines driving Argus-designed air-pressure-actuated variable-pitch propellers. The award of a development contract was followed by the first flight of a fourth prototype, forerunner of the production Fw 189A, which was powered by two Argus As 410A-1 engines and armed with only two MG 15 machine-guns. The fifth prototype was representative of the proposed Fw 189B dual-control trainer, its redesigned fuselage nacelle having a stepped cockpit and much reduced glazing. It was the dual-control trainer which gained the first order in the summer of 1939, for three Fw 189B-0 pre-series and 10 Fw 189B-1 production five-seat crew trainers. These preceded the Fw 189A into manufacture and service, some being used as conversion trainers by 9. (H)/LG 2 during the spring and summer of 1940. In a similar manner the construction of 10 Fw 189A-0 pre-production aircraft began in 1940, some of them being delivered to 9. (H)/LG 2 for operational trials, and being followed by the initial production Fw 189A-1 which was armed similarly to the Fw 189 V2 prototype, except that the MG 15 was deleted from the nose position and an Rb 20/30 or Rb 50/30 camera was carried. 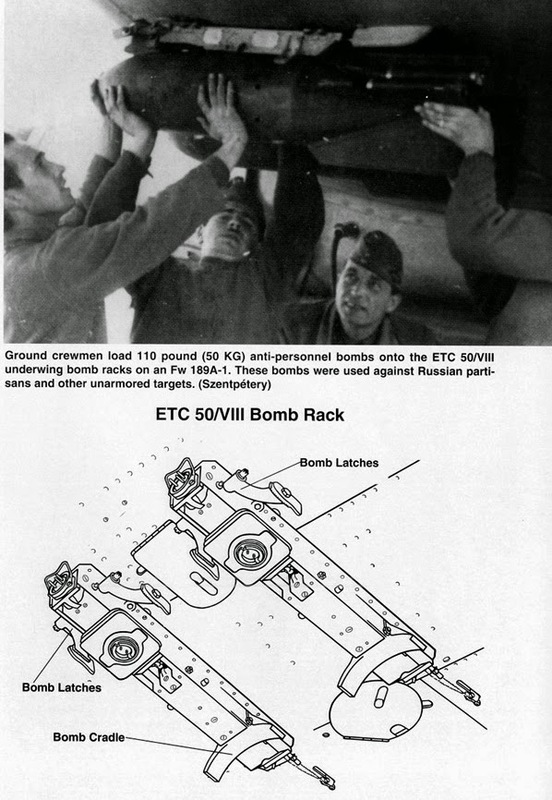 Further developments of this version included the Fw 189A-1/ Trop which carried desert survival equipment, and the Fw 189A-11U2 and Fw 189A-11U3which were equipped as personal transports for the use of Generalfeldmarschall Kesselring and General Jeschonnek respectively. The remaining Fw 189A variants included the Fw 189A-2 introduced in 1942, which had the flexibly· mounted MG 15 machine-guns replaced by twin 7.92mm (0.31-in) MG 81Zs; the Fw 189A-3 two-seat dual control trainer which was built in limited numbers; and introduced in late 1942, the light ground-attack Fw 189A-4 which was armed with two 20-mm MG 151/20 cannon and two 7.92-mm (0.31-in) machine-guns in the wing roots, and had armour protection for the underside of the fuselage, engines and fuel tanks. Unbuilt project included the c1ose-support Fw 189C and the Fw 189D twin-float trainer; the seventh prototype, which had been intended to serve as the development aircraft for this last variant, was completed instead as an Fw 189B-0. The use of alternative powerplant was planned for the Fw 189E, a French-built Fw 189A-1 airframe being modified by the installation of two 7oo-hp (522-kWI Gnome-Rhone 14M radial engines, but when this prototype crashed while being flown to Germany for evaluation, further development was abandoned. Final production version was the Fw 189F-1, basically an Fw 189A-2 re-engined with two 580hp (433-kW) Argus A 4llMA-1 engines; a similarly-powered Fw 189F-2 introducing electrically-actuated landing gear and increased armour and fuel capacity was planned, but none had been built when production ended in 1944. 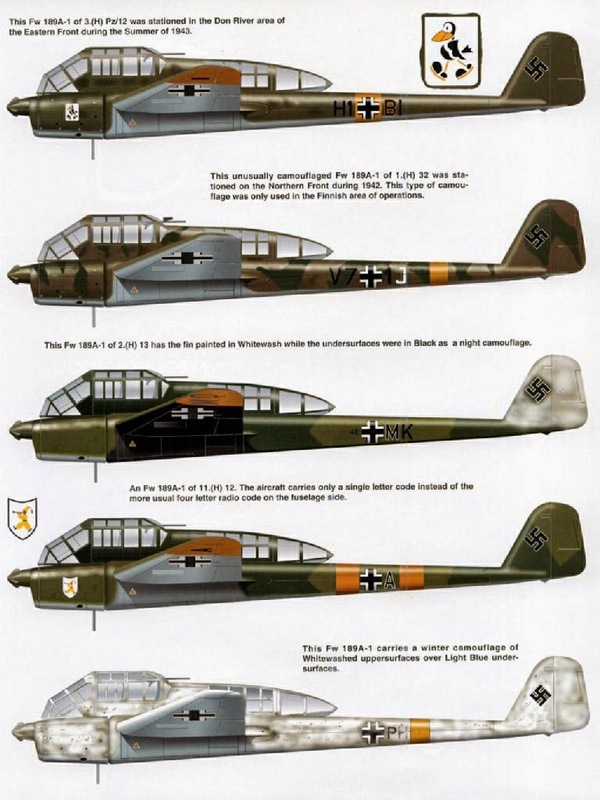 Total production of the Fw 189 then amounted to 864 aircraft including prototypes, built not only by Heinkel but also by Aero in Prague from 1940 to 1943, and by SNCASO at Bordeaux-Merignac until 1944. 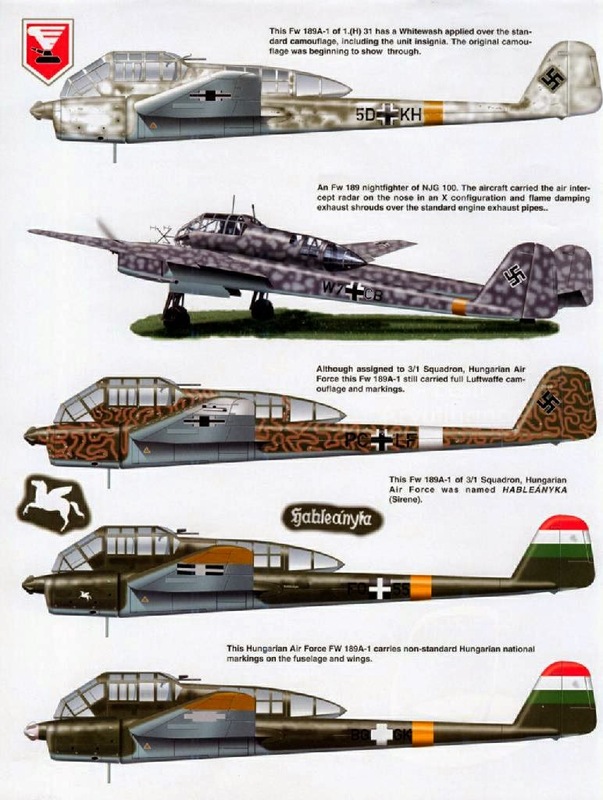 Fw 189s were supplied in small numbers to the Slovakian and Hungarian air forces operating on the Eastern Front, in which theatre the type was deployed most extensively by the Luftwaffe, but at least one Staffel used the type operationally in North Africa.